Even though the analogy to a hinge is often made, the knee joint is much more than a simple hinge. The knee is a complex machine made up of the following major structures: bones, muscles, ligaments, cartilages, and tendons. There is also a complex and elaborate network of nerves and vessels that runs throughout the knee. 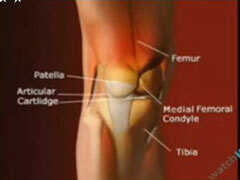 The knee is the largest joint in the body and sometimes has to bear up to four times the weight of the person’s body. The motions that the knee is capable of consist of bending (flexion) and straightening (extension), with a limited degree of rotation and sliding.